I may have mentioned that I was doing a jewellery course in September. Well here we are in November (mid) and I don’t think I’ve written anything about it yet. In fact I’m not sure I’ve written anything in the blog since then! Good intentions! So I went to the jewellery making and it was quite interesting but not as good as I’d thought and there didn’t seem to be any place to use my shells. So I’ve done a bit of research and using some of the techniques I learned I’m going to have a go at doing this necklace. I was thinking that I may even start selling jewellery if it all goes well, though I’m not exactly a business woman. On another note, I’ve just moved back to my home town of Brighton – though it has since become a City and joined up with Hove. The City of Brighton and Hove. Sounds very grandiose and of course the price of housing has soared since they changed it all. But it’s still Brighton to me and I’ve rented a nice flat to be near my parents. Of course I’ve had to leave my job too but if you’re arty Brighton is the place to be and I’ve already been networking and got a few irons in the fire. I’m hoping to land something that’s more suited to my artistic abilities! Perhaps I could work for a jewellery shop and they would sell my unique creations – oh well dream on! 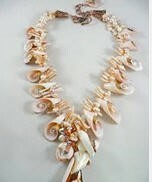 So if I decide to specialise in sea shell jewellery, at least I’m close to the beach. Unfortunately so are thousands of others so I don’t expect there’s much to be found unless the tide washes something interesting ashore. Meanwhile I’m going to stock up on all the stuff I need to get started making jewellery and I’ll report back. First on the list is a little drill to make holes in my shells. Wonder where you get those – Amazon probably, they seem to have everything. Then I’m going to wander around the Brighton Lanes to get some inspiration. I think I could be pretty good at making jewellery so let’s get started.